Copper 1 Polushka of Elizabeth. 1743-54. 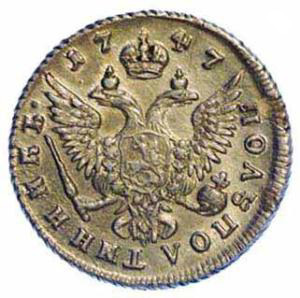 Reverse: Denomination in russian and date in numbers. Copper 1 Denga of Elizabeth. 1743-54. 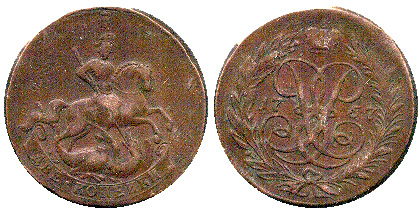 Copper 1 Denga of Elizabeth. 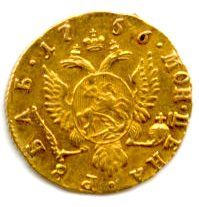 1757-59. 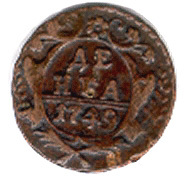 Obverse: Monogram of Elisabeth and date in numbers. Reverse: St. George slaying the dragon. Copper 1 Denga of Elizabeth. 1757-60. Obverse: St. George slaying the dragon. Reverse: Monogram of Elisabeth and date in numbers. 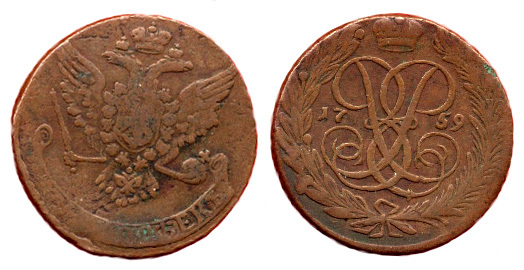 Copper 1 Kopek of Elizabeth. 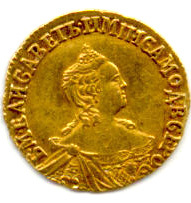 1756-57. 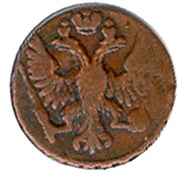 Copper 1 Kopek of Elizabeth. 1757-61. Copper 2 Kopeks of Elizabeth. 1757-62. Copper 2 Kopeks of Elizabeth. 1758-61. 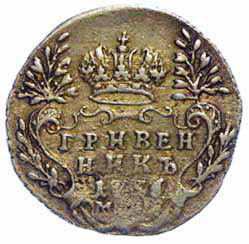 Silver Grivennik (10 kopeks) of Elizabeth. 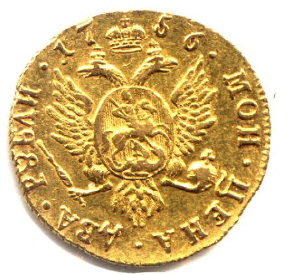 1742-57. Reverse: Year in numbers and legend in russian. 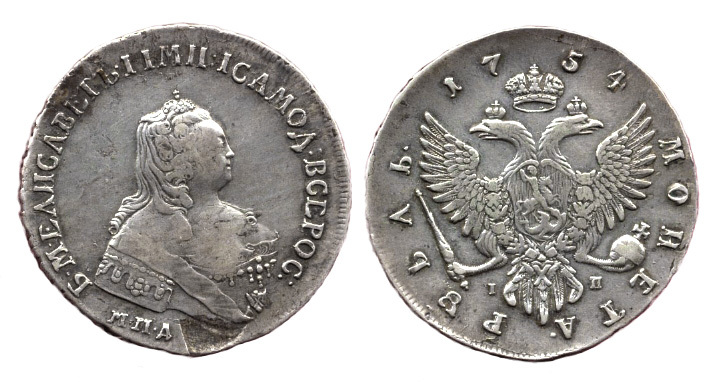 Silver Polupoltinnik (25 kopeks) of Elizabeth. 1743-54. 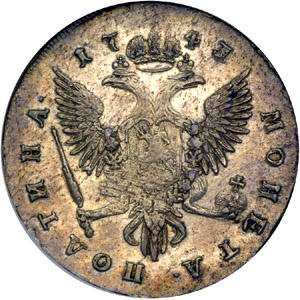 Reverse: Double headed eagle and legend in russian. Reference: K-17, 17a & 17b. 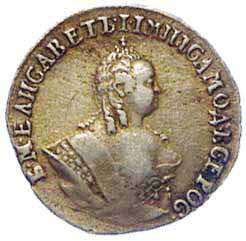 Silver Poltina (50 kopeks) of Elizabeth. 1743-51. 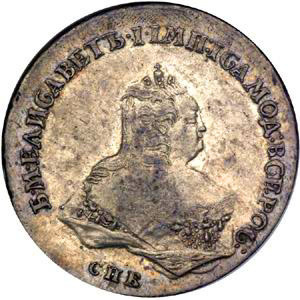 Silver Ruble of Elizabeth. 1751-54. 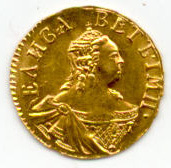 Gold Poltina (1/2 Ruble) of Elizabeth. 1756. 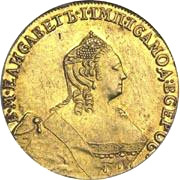 Gold Ruble of Elizabeth. 1756-58. 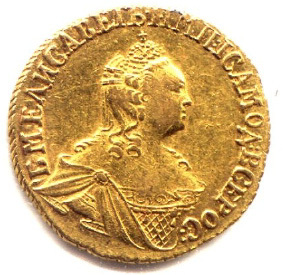 Gold 2 Rubles of Elizabeth. 1756-58. 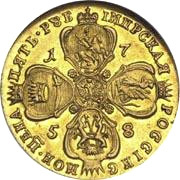 Gold 5 Rubles of Elizabeth. 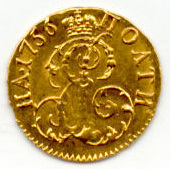 1756-59. 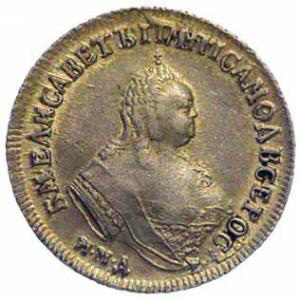 Gold 10 Rubles of Elizabeth. 1755-59.